TÁNAISTE SIMON COVENEY has said there is a lot is concern among EU member states about the prospect of a long extension of Article 50, as the British Prime Minister Theresa May is on the cusp of asking to delay the date by which Brexit must happen, currently set for 29 March. His comments come after the EU’s chief negotiator Michel Barnier said that EU member states should prepare for a no-deal Brexit. If MPs vote for Theresa May’s draft Brexit deal this week, May said that she would ask for an extension to Article 50, and delay the Brexit date by three months until 30 June. But to do this, the UK must get the permission of the EU’s 27 countries. EU leaders have said previously that without a clear reason for leaving, the request to push that date out wouldn’t be likely to be accepted by the EU. Speaking after Cabinet this evening, Coveney said that “there is a lot of concern among EU member states and partners about the prospect of a long extension to Article 50″. 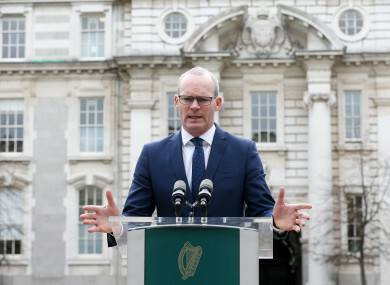 “The disruptive effect of Brexit for another nine months or another whatever period of time is something that I think people will need convincing on,” Coveney said. He said that if there is a request for a long extension, “there will need to be a very persuasive plan” to go with that which would explain why that’s needed and how the UK will use the time to “conclude the outstanding issues that haven’t been able to be agreed in London in the context of the Brexit process”. Coveney also said it has been “very clear” that there is “absolutely no appetite” to reopen the Withdrawal Agreement” from the EU. Does an extension increase the chances for the ratification of the Withdrawal Agreement? Will the UK request an extension because it wants a bit more time to rework the Political Declaration? He added that the political declaration could be made “more ambitious” if a majority in the House of Commons wanted that. Extending the uncertainty without a clear plan would add to the economic cost for our businesses but could also incur a political cost for the EU. Coveney also warned that “it’s important that the British government gets the message from EU countries that while … there is an openness to an extension of Article 50 that EU leaders will be demanding in the context of a persuasive plan to accompany that extension”. He said this is to ensure “we can all move forward with some confidence that the outstanding issues relating to the Brexit process can be resolved”. Barnier said that the European Council, which is made up of the leaders of the EU’s 27 countries and is due to convene this Thursday and Friday, will need to assess what is in the best interest of the EU. “Voting against a no-deal does not prevent it from happening,” he continued, adding that it was “for the British government to decide what the UK wants to do next”. Everyone should now finalise all preparations for a no-deal scenario. On the EU-side, we are prepared. Taoiseach Leo Varadkar met with European Council President Donald Tusk at Government Buildings in Dublin this morning; meanwhile, Tánaiste Simon Coveney is in Brussels and has held meetings with UK Cabinet Office Minister David Lidington and Michel Barnier, among others. Email “'A lot of concern' among EU states over prospect of Article 50 long extension, Coveney warns”. Feedback on “'A lot of concern' among EU states over prospect of Article 50 long extension, Coveney warns”.